The Judge begins the day by granting the application for postponement that was submitted by the State yesterday. The court will be on recess starting this Friday and will commence on Monday, May 5. Roger Dixon is still on the stand. They show a photo and Dixon explains that he was asked to prepare a diagram of the various heights of marks. He measured the heights of bullet holes B, C and D. They range from 97 to 104 cm. He also measured the heights of the ricochets marks E and F. Mark E is on the left and mark F is on the right. Next he measured the magazine rack and the front portion is 62cm from the floor. The back portion is 76cm from the floor. His observation is that mark E on the wall has horizontal marks, meaning that the bullet didn’t hit that mark head on; it grazed along the wall from the side. He states you can see metal on the wall. He used an x-ray spectrometer and picked up the presence of copper and lead. This means the bullet still had the jacket on at this point. 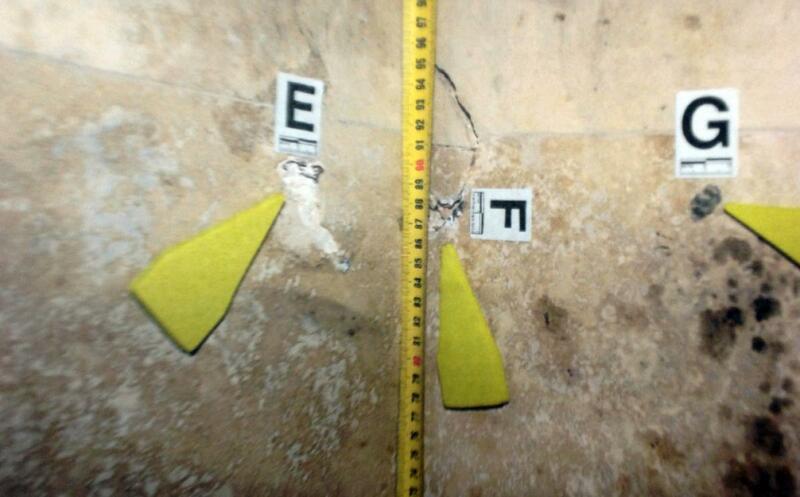 So the bullet grazed along point E and hit point F, creating the cracking of the tiles. Roux asks him what the energy of the bullet would be after it hits point F. Dixon says the amount of speed and energy will be reduced at this point. By the time it hit F, that would now be the 3rd thing that it hit (first the door, then grazing the wall and finally hitting the tile.) If it had lost all of its energy, one would expect it to fall to the floor. If it still had energy left, it could ricochet again in a direction. Although he can’t say for sure which direction, he would expect that it would probably bounce backwards from there. However, if there was a breakage plane in the tile, then it could bounce at an angle. So there really is no definitive way to know where it would have gone. He goes on to say that in order for it to hit the back of the deceased, it still would need to have quite a bit of energy. The wounds that are on her back are one on top of the other running along the spine. He doesn’t see how the bullet could have come downward and strike the bottom contusion and then go upwards causing the vertical striations. Also he would expect that the projectile would have jagged edges at this point from the jacket causing cuts and tears in the skin. Roux reads from Saayman’s findings that these contusions were caused by some type of blunt object, edge of chair, possibly even a missile. One of the junior lawyers goes in to the box with Dixon and Dixon holds the photo of the confusions to his back so we can become familiar with the orientation of the wounds. Each contusion is along the spinal process, the hard boney part of the spine. 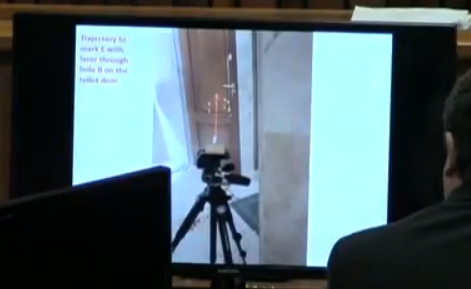 Dixon repeats that he can’t conceive of a scenario where the bullet would hit the bottom contusion and go upwards. Roux says it’s also common cause that there were no holes in the back of the t-shirt. He wants to know what Dixon thinks about that. He believes this indicates that there was no fabric covering that area. He would expect that there would be some type of stretching on the shirt in that area. He believes that her shirt likely was lifted up as she fell down. Roux says there is another issue with Mangena’s assertion that the contusions were caused by a bullet fragment, and Roux says that is the “mass” of the bullet. Dixon goes on to say that “numbers are not his best friend” so he has to refer to his notes. 1. Bullet A was retained in the abdomen so that would not have hit her back. 2. The bullet that hit her arm fragmented in the bone and there were bits and pieces in the front of her shirt and some on the floor. Those pieces would not have been able to go backwards so that excludes this projectile as being the cause of the back wounds. 3. With the head wound, the largest piece that was retained in the head weighed 93.6 grains. The mass of a black talon is 127 grains. If a piece came out of the head exit wound, it would have to be approximately 33 grains. This is likely not large enough to cause the size of the contusion that was on her back. The fragment of the bullet core that was found in the toilet bowl weighed 65.9 grains. If you add 65.9 (from the one in the bowl) to 93.6 (the one in the head), you get 159.50 grains which is in excess of what a bullet weighs. Therefore, the bullet fragment in the toilet bowl cannot be the other half of the bullet that went through the head. The remaining head bullet fragments were likely on the ground. 4. 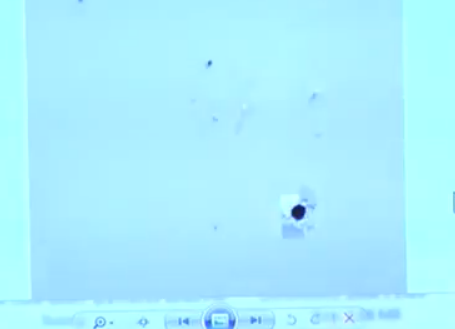 The fourth projectile is the one that hit the wall at points E and F. He believes this impact caused the jacket to come off and the core itself is what landed in the toilet. The jacket then would have either fallen to the floor or ricocheted elsewhere, but he believes this jacket would be too sharp to cause the wounds on her back. Dixon does agree with Mangena’s assertion that the hip shot was the first one. 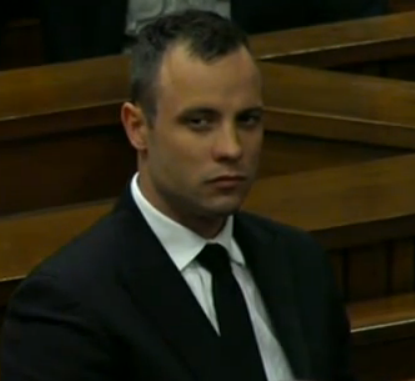 Roux wants to know if he agrees with Mangena that Reeva was standing in front of the door and facing the door. He states that the autopsy said the wound was eccentric, not concentric. If she was standing in front of the door and the bullet came at her straight on, he would expect the wound to be concentric. If she was standing in front of the door and it came at her at an angle, it would be eccentric. But we do know the bullets were fired at an angle, so I’m not sure how his point helps the Defense. I think it actually supports the State. 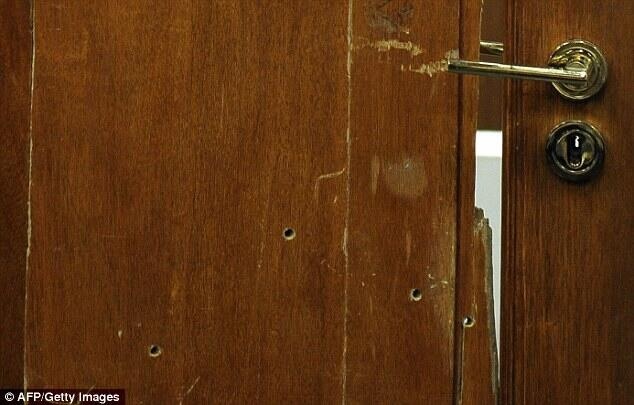 She can still be standing in front of the door facing it when the bullet hit her at an angle. Roux asks him to state his opinion on how she was standing when she was shot. Dixon says that based on the splinters in her forearm, together with the puncture wounds around the hip wound and some splinters seen in her torso, he believes she was leaning toward the door handle with her arm stretched out higher than the area where the bullet hit the hip. He also notes there were splinters found in the upper arm and in the t-shirt and states the person would have been quite close to the door. There were no splinters found in the head or on the hand wound. He believes this is because these parts of the body were now far enough away from the door when they were hit that they were not impacted by spraying splinters. He thinks that after the initial hip and arm shot in front of the door, she would have fallen as her right hip gave out. Her right arm would have no function so would be limp at her side. He thinks the left hand was probably in front of her as an involuntary contraction type movement from the shock of the initial bullets and the bullet that missed her and hit the wall went thru the webbing of her fingers at that point. And then for the head wound, he believes that she would be sitting too high up on top of the magazine rack for the bullet to hit her head considering the height of the bullet holes. The highest hole was 104cm and the lowest was 93cm. He also thinks she’d be too low if she was leaning over. So his conclusion is that the 4 bullets were fired in rapid succession and the 4th bullet hit her in the head as she was in the process of falling down. He says she would have fallen against the rack, landed on the floor with her head coming to rest on the toilet bowl. He thinks that she fell against the magazine rack on this area of the wood. They move on to sounds now. Roux first replays the cricket bat sound test from yesterday. The first sounds are from 60 meters, the second at 180 meters. Then he plays the gunshot sound test which was also done at 60 meters and 180 meters. The cricket bat sounds start around 53:28 on this video. The gunshots start around 54:40 on this video. 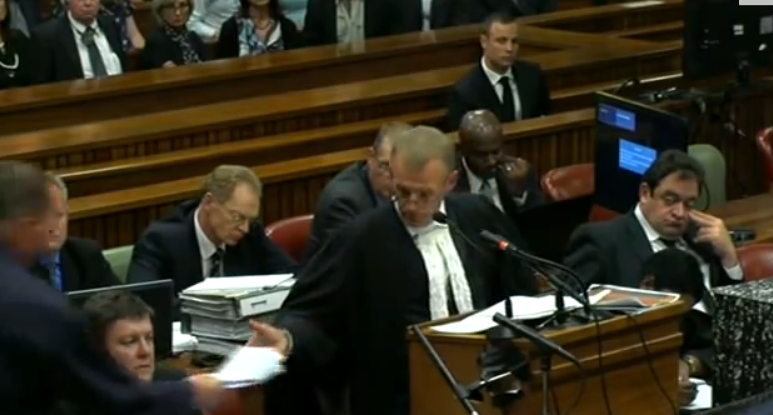 Roux rests and Nel begins cross-examination. Nel’s first question… “Mr. Dixon, you are qualified as a Geologist, am I right?” Dixon says his first degree was in Chemistry and Geology. His current employment is at the University of Pretoria in the Department of Geology. Nel says that he sees he is not currently affiliated with any forensic body and Dixon says that’s correct. Nel establishes that he had previously worked for the forensic lab with the police. Nel asks him if he understands the difference between an expert witness and a normal general witness. He says he does. Nel wants him to explain. Dixon says the layman does not have specific knowledge in the area in which they are testifying. The expert would be somebody who has experience in applying their training to the matter at hand. Nel points out that an expert witness should be able to show the court how they came to their conclusions and what processes they used. Dixon says if it is requested then yes. Nel says not just when requested, it’s essential for everything. Dixon says he agrees. Dixon then goes on a long explanation of how he used other experts’ reports and paired them up with his own knowledge and investigation. He acknowledges that he is not a ballistics expert, nor is he an expert in numerous other fields. In reconstructing the sequence of events, he believes that his training as a Geologist is quite applicable and he once again goes in to a long explanation of why. Nel asks him if he is a sound expert. His answer is “I would hope that my evidence that I present is sound.” I really can’t help but laugh out loud at this answer. Nel then, fairly exasperated, asks again, “are you a sound expert, sir? Have you received training in decibels and sound?” Dixon answers that the sole purpose of the sound tests was to see if the sounds of a cricket bat hitting the door could be confused for the sound of gunfire. Nel wants to know what expert skills he used to do this. Dixon says the expertise used was reconstructing a situation. His part of the test was to wield the bat to produce the sound that other people were recording. Nel asks him, who was involved in this expirement? Dixon says the range officer, Mr. Wolmarans (ballistics expert), Mr. van der Westhuisen (also ballistics expert), the wives of the ballistics experts, two sound recorders (he didn’t know which company), and possibly a few others. Nel asks if he wore ear protection during the cricket bat test. Dixon says no. A cricket bat doesn’t make the same cracking noise at close range. Nel asks if his ears were ringing after he hit the door and he says he noticed some echoing. Nel asks if his analysis of visibility in the dark required any expert skill. Dixon says that the instruments he used were his eyes. He says he wasn’t measuring light levels and he’s not an expert in this field. Nel asks if anybody else used instruments to measure light levels and he said not when he was present. Nel recaps… so for the cricket bat test you just hit the door with a bat. And for the light test, you just looked with your eyes. Dixon agrees. For the fiber evidence, Nel wants to know if he did any analysis. Dixon says he looked at them under a microscope and saw a consistency between the fibers on the door and the fibers on the bottom of the prosthesis. He did not go further to determine what type of material they were because in his mind he had excluded all other possibilities. Nel asks him if he compared the fibers on the door to the fibers on the sock and Dixon says no, he did not have the sock for testing. He only looked at the fibers on the bottom of the prosthesis. Nel asks him if he ever saw the socks and he said he saw photos of them being worn at the scene but he didn’t actually examine them. His deduction was that the fibers that were attached to the sole of the prosthesis came from the sock that was worn. Nel asks him if he ever had the socks in his hand. First Dixon says that on November 15th at the forensics laboratory he remembers the clothing being there but then continues on after some prodding from Nel that he never touched them. Nel wants to know why he’s avoiding the question. Instead of answering Nel’s question he just says “I did not pick them up.” Nel called him out on this and Dixon really couldn’t say much more. Nel asks Dixon if he is a blood spatter expert. Dixon says he has received no training in this area. 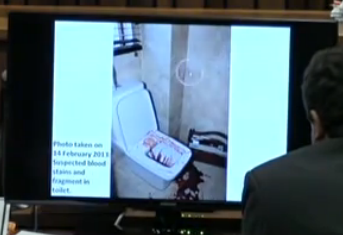 Nel points out that yesterday he referenced blood on the door when he was doing direct with Roux. He wants to know what inference he made about that blood. Dixon answers that his inference was the panel was broken and there was blood on one side and not the other. Nel then asks, didn’t you tell the court yesterday that one panel fell on to blood? Dixon says he can’t say where the blood was that got on that panel. Nel shows him some photos to test his knowledge of the scene and where items were found and Dixon can’t really comment. Nel is pointing out to him how silly it is for him to be giving testimony on blood and where it came from when he clearly doesn’t know the scene, nor is he qualified to testify about it. Nel then covers Dixon’s expertise as a mark analyst. Dixon does believe he is an expert in this field and his evidence has been accepted in court a number of times. 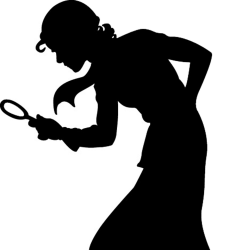 Nel asks, at the forensics laboratory, one has to constantly do proficiency tests to indicate that you are still proficient in your area of expertise, is that correct? Dixon says in your main area of expertise, it is typically the norm to do one test per annum and for other areas, if they are available, once every two years. Nel wants to know when he did his last proficiency test. Dixon does not recall. When pressed further by Nel he says that he thinks it was 2011 or 2012. Nel wants to know if he does any other refresher courses. Dixon talks for a long time about his experience, but does basically say that there is no course that teaches physical matching. 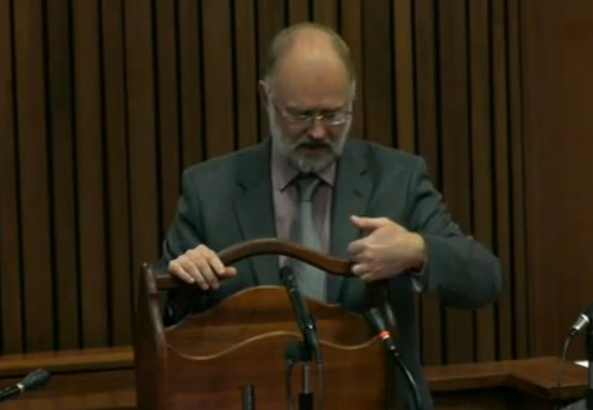 Nel points out to Dixon that yesterday he referenced “a” cricket bat when talking about the marks. He wants to know if he used “the” cricket bat when doing his physical matching on the door. 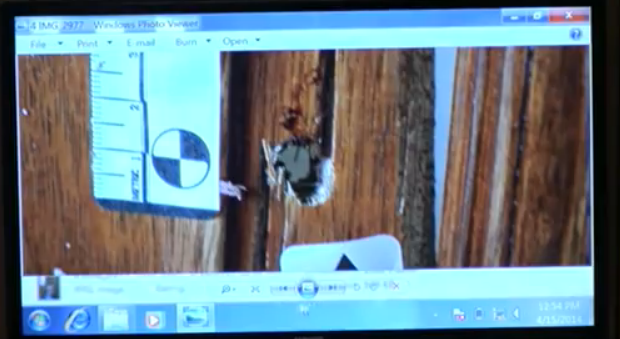 Dixon starts talking about the sound tests on the door and says that he used a different bat to hit the door. Nel stops him and points out that he’s not answering his question. The question was about the physical matching. Did he use the actual bat or not. It’s a pretty easy yes or no question. Dixon gives a very long winded answer that honestly I can’t even summarize. Nel points out again that his question was whether or not he used the actual bat to do his physical matching. Another long winded answer on Dixon’s behalf finally reveals that he did hold the bat in his hand at the forensics laboratory on November 15th. Nel wants to know if he ever consulted with Dr. Perumal (the pathologist who was at the autopsy for the Defense team). He says no, he did not. Nel wants to know if he read his report. He says yes, he did. Nel wants to know if Perumal’s report helped him reach his conclusions. Dixon says that Perumal’s report was very similar to Saayman’s report so he used Saayman’s. This is the same exact answer that Dr. Botha gave on the stand. This must be the standard Defense script for this question. Remember, Dr. Botha is the man who came to testify about the autopsy findings, not Dr. Perumal who was actually present for it. One can pretty safely infer that Dr. Perumal did not want to come and testify because he cannot make the assertions that the Defense team wants him to make, most likely about the stomach contents. Also, Dixon is now being called out by Nel for not being an expert in many of the areas that he’s testifying about. There were ballistics experts that worked on this case for the Defense, but instead they are trying to sneak in evidence via Dixon and it’s not working so well for them. You don’t have to be a rocket scientist to figure out that the Defense team is having a hard time getting their qualified experts to come to court and support their theories. Nel asks Dixon if he has drafted a report to support his evidence. Dixon says that in the course of examining materials and informing counsel, he did write various reports. So Nel calls him on this. He wants to know specifically which reports he has written. He stumbles here and then says they are on his computer at home. He starts to say that his reports include his observations about the lighting, he also took photos… and then Roux stands up. Roux says he can help Nel out; he has a report that he’d be glad to give him and he hands it over. Nel looks at it and says that according to the paperwork it was drafted on April 5, 2014. It’s a report with photographs about the marks on the door. Dixon then chimes in and explains how he has updated various reports over the past year as information has changed. But what he’s testifying to in court is what is being asked of him in court, not necessarily what is in the reports. This answer is obviously a red flag, as well as the fact that the Defense did not give Nel a report prior to Dixon’s testimony. Looking back at Oscar’s testimony over the past week, I think Nel did a great job of proving that Oscar tailored quite a bit of information on the stand. He seemed to be changing and adding things as the days went by. No doubt the Defense team is now scrambling to support the details that Oscar has changed or added. A perfect example of that is the “double tap” theory. That was thrown out after Mangena testified for the State and I guarantee you that is part of the reason why the Defense sent Wolmarans back to the shooting range to record the newly theorized “rapid succession” gunshots. You will read more about that later in this post. The next report that Nel holds up that was just given to him by the Defense is the “origins of two contusions on the back” dated April 5, 2014. Also the “wood sequence in relation to position and posture” dated April 5, 2014. Nel points out, there is no report here for the lighting conditions. Dixon says there were bits of notes and paper sent over the course of a year. Nel points out that he’s reading from bits of paper in front of him today. Dixon says these are his notes to remind him of details. 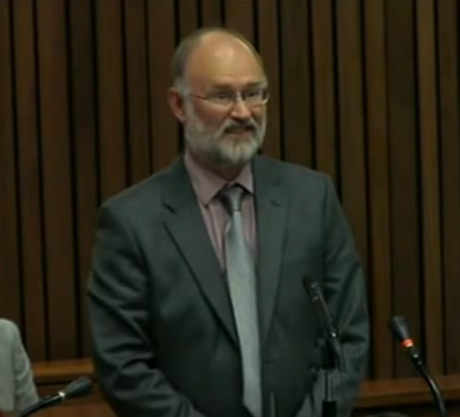 Nel tells him that if he had a proper report before court, then notes would not be necessary. Dixon says he was not requested to do that. This whole exchange is pretty embarrassing. Dixon is flipping through his notes now and explaining what each one says. He’s also talking about the rest of the Defense investigative team and starts to get himself in trouble with that. He claims to have seen a draft of the ballistics report but not the final one. When they come back Nel tells Dixon that since he has not read his reports yet, he is just going to ask him general questions at this point. Nel wants to talk about the draft ballistics report from Wolmarans that Dixon has supposedly seen a copy of. Nel asks Dixon if he agrees with the sequence of shots that Wolmarans reported. Dixon says he thinks there may be differences from then to his interpretation now. Nel wants to know what the differences are. Dixon says he doesn’t know because he hasn’t seen the final report. Nel says, I’m not talking about the final report, I’m talking about the draft report that you saw. What are the differences? Dixon says he can’t remember because it was a while ago. Nel points out to him that he was the one who just said there were differences, so what are they? Dixon says he does not remember specific differences. He does remember that as the case progressed and more information became available things changed, but again, nothing specific. Dixon again verifies that he did not have access to the final report of Wolmarans. This was a totally nonsensical, evasive answer. Nel then asks him if he has seen the final report from the sound recording people. Dixon believes that the actual sound recording itself was essentially the report, meaning there was no written component. Nel asks him if he feels, as a scientific expert, that just recording sounds is enough. Dixon says yes. Nel points out that the court doesn’t know where they were, what recording equipment was used, how the door was set up, etc. All Nel wants to know is if Dixon, personally, feels that just recording sounds is enough. Dixon pauses a bit but ultimately answers yes without elaborating. Nel asks if there were any decibel tests done of the two different sounds. Dixon says to the best of his knowledge, no decibel tests were done. Nel wants to know if Dixon agrees with him that there is a difference in decibel level between the gunshots and the bat sounds. Dixon agrees. Nel then says there is something that Dixon has not shared with the court. That would be the retesting that was done last week. He asks Dixon about that. Dixon says he was not involved in the retesting but is aware that it was done. Dixon says that for the original tests a gun was obtained by Mr. Wolmarans, the same model that Oscar had. The gun was brand new out of its box but there was a problem with it and it kept jamming after each shot, so each shot had to be fired individually. In order to replicate the rapid succession sound, they took a recording of the single shot and then repeated it to create the sound. But Dixon goes on to say that this is not considered to be a true reflection of events. Therefore, Mr. Wolmarans went back to shoot shots in succession to give a true recording of the noise rather than a repeated sound. Nel points out to Dixon that when the sound tests were played in court, he stood there and identified those sounds, however he wasn’t present when some of them were done. 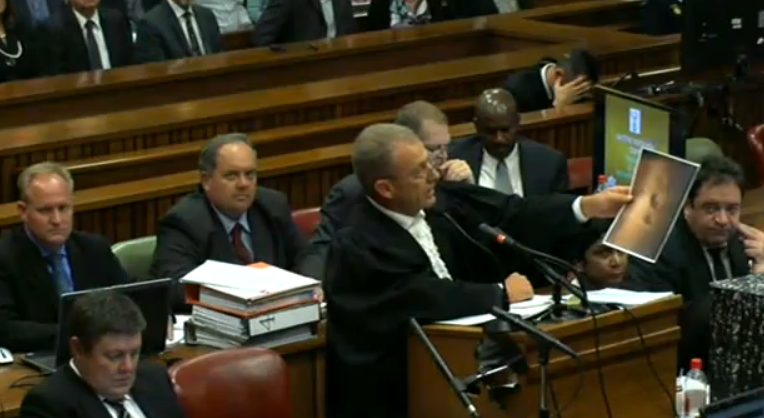 Nel puts to Dixon that this is about his integrity. He wants to know why he would be here in court testifying about gunshots when he wasn’t present for them. Dixon says because he has heard gunshots before. Nel tells him no, that’s not good enough. He wants to know why he identified gunshots that he was not present for when they were fired. Nel tells Dixon that it is a serious thing to be testifying about sounds that he was not present for. Roux objects. He believes that when the gunshot sounds were played in court, Dixon was not specifically asked to identify them as the test shots that were fired on the same night that the cricket bat sounds were recorded. He was just asked to identify them as gunshots. Nel says his argument to the court is that Dixon never informed the court that the sound tests were done at two different times, he presented them as one occasion. The Judge tells him to argue that at the end of the case after they have all read the record. I really think the Defense was trying to avoid having to put Wolmarans on the stand because, first, I think it’s possible that his opinion of the sequence of shots matches what Mangena said. And second, I think he was forced to go back to the shooting range after Oscar/the Defense changed their double tap story. I think they are trying to pawn it off on a gun that wasn’t working properly (sound familiar?) but it really was because the testing that they had did not match the brand new rapid succession theory. It’s all very suspicious. The more that Nel discredits Dixon, the more need for the Defense to now put Wolmarans on the stand. Nel asks Dixon if they took any video of the testing that they did on the range. Dixon answers no. Nel points out that the only person who then can give the court any details about how these tests were done is him. He agrees but states that there were other people present. Dixon now tries to explain to the court how he did the cricket bat testing – at what distances, how the bat was held, what was recorded, etc. but his recounting of it is quite confusing. Nel stops him and asks the Judge if he can request that the Defense turn over a report about the testing (not just a recording of the sounds) so he can review it and so that it can be handed up to the court as well. Roux says yes, he can do that. He also says the State is entitled to this. He was going to hand it over with his next witness, but he’s ok to do it now. They all agree. And there it is… obviously Roux was trying to slip this past everybody, and uses the silly explanation “I was going to have the next expert do it” but surely everyone can see through that. Nel then says, “since we now know that Mr. Wolmarans is going to be the next witness,” tell me what Wolmarans’ role was on your first night at the shooting range. This produced a good laugh from Oldwage. Dixon says Wolmarans organized the range, as well as the recording people. He was there in a supervisory capacity. Mr. Wolmarans sat with the recording engineer and listened to the sounds at 60m and 180m. He was not involved with the striking of the bat. On the same night that Dixon was there for the testing, the gunshots were fired by Mr. van der Westhuisen. He wants to know when he heard the recording. Dixon says this past week, the last few days. Nel wants to know where he was when he listened to it. Dixon says in the high court chambers on the 8th floor. Nel asks who was present. Dixon answers Mr. Wolmarans, himself, and the counsel seated in front. Nel wants to know if it was explained to him how the testing was done. Dixon answers, no he does not know the exact process they used and can only assume it was the same range. He has no knowledge of who fired the shots. Nel goes back to the first night of the original testing and wants to know if the recording of the gunshots was ever played for him. Dixon says yes. Nel asks when. Dixon says he acquired copies and he listened to them himself. Dixon then says they were played to them the night the recordings were captured so that they did not leave the range with poor recordings. They had to make sure that everything worked. Nel asks him how many shots were fired that night. Dixon says he cannot say exactly but it was not very many. Possibly 6 or 8. He said they were aware that because the gun was jamming, they would likely have to do the testing again. Also, he goes on to say that they did not have a lot of ammunition because the black talon ammunition is difficult to get. 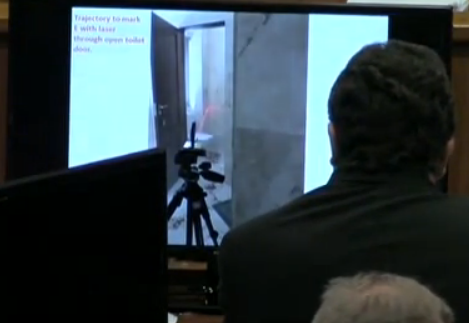 Nel establishes with Dixon that there were two options that must have been discussed after that test – one option would be to do retesting and the other option would be to create the rapid succession sound by using electronics (repeating the sound of the single bullet as Dixon earlier testified.) Nel wants to know more about their discussion in relation to electronically engineering the sound. Dixon says the sound engineer that they used was a music producer and the editing of recordings is a common aspect of sound production. Dixon had suggested that they play the recording in fast succession, however in order to present a sound that has not been tampered with by editing, Mr. Wolmarans went back to do the retesting with the gun. Dixon says there was no design or intent on the night of this testing to mislead the court, the prosecution or the defense. Nel asks him, then why did you not tell this information to the court? Dixon says it didn’t come to his mind that it was in question. Nel makes the point that they chose to use a music producer rather than somebody who specializes in the sounds of gunshots or explosions. Dixon starts talking about his discussion with the sound engineer that night, and starts to tell the court what the engineer said to him but Nel stops him. He does not want Dixon to give hearsay evidence. Dixon then explains how he went online to listen to sound bites that are used by people when they dub them in to movies, like wood breaking, bats hitting, etc. Nel interrupts Dixon because he’s going off on a bender with his answer and as the two men are talking over each other, the Judge steps in and gently asks Nel to restrain himself. 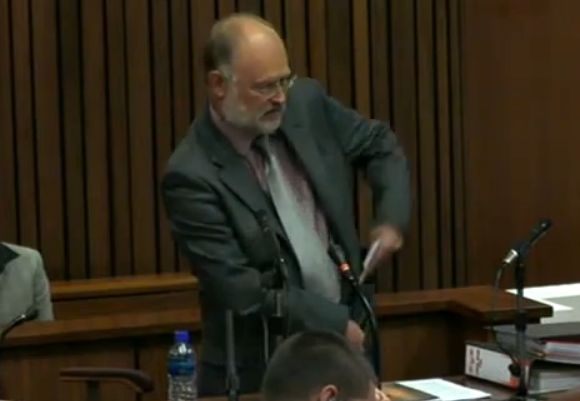 Nel cools off a bit and reminds the witness to respond to the actual question that is being answered. Nel asks, was this sound expert an expert in recording sounds such as gunfire and explosions? Dixon says he does not have knowledge about the engineer’s expertise. Nel asks Dixon if he is an expert on wound ballistics. Dixon says no. He then asks if he’s aware that Dr. Saayman is an expert on wound ballistics. Dixon says upon reviewing his CV, he’s aware that he has some expertise in that area. Nel asks him when that was. Dixon says he believes it was in March at the beginning of the trial. He also asks who was present. Dixon says both counsel and Mr. Wolmarans. Nel asks, “did the accused give you an answer?” Dixon says yes, he said there was a strong vibration. Nel asks, with which strike did he say there was a strong vibration? Dixon says the first strike. Nel wants to know if he asked him about the other strikes. Dixon says, if his memory serves him, it was just the first strike. Nel then wants to know if he asked him about his position in front of the door – if he moved or if it changed? Dixon does not recall this question. He believes he assumed that he was moving around as it would be unlikely that somebody would be standing in the same exact spot. Nel asks to see Dixon’s notes that he has in front of him. The court hands them to Nel and he puts them down on the desk and continues with questioning. It looks like Vermeulen is taking a peek at them. Nel now wants to deal with Dixon’s ballistics expertise. Nel says, you have made a finding, and he’s using that word “finding” loosely, that the deceased was standing upright behind the door when she was shot in the hip. He wants to know which hole in the door that would be. 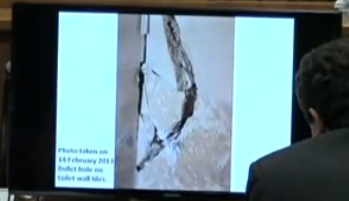 Dixon says according to the reports of Mangena, and utilizing the height of the hole on the door, he concurs that it was hole A. He then asks Dixon which bullet hole belongs to the bullet that missed the deceased. Dixon answers that in his opinion, none of the bullets missed her. 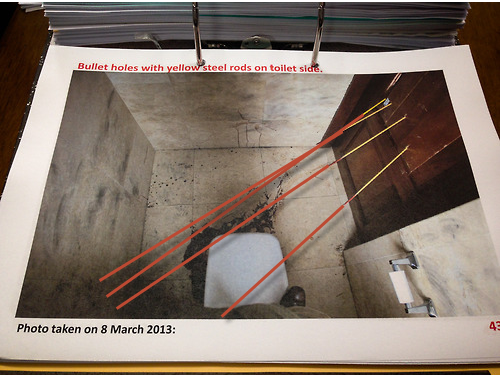 Nel then asks him which bullet hole belongs to the ricochet mark E on the toilet room wall. Dixon answers probably C, however C and D are close so it could be either. Nel wants to know why he answered that. Dixon says because the height of the arm injury is high. The deceased would have fallen after the hip injury but would start falling a bit slowly and then quicker as she goes down. He thinks the higher height of bullet B makes sense in hitting her arm. So, hole B goes along with the arm shot. Nel wants to know how he is able to establish this. Dixon says he was present at the examination when probes were put in the holes by Mr. Wolmarans. Also, he has read the report of Mangena. The trajectories all come to the general area of the corner of the toilet room. He was looking not only looking at the action of the bullet and its path, he was also taking in to consideration where the person was standing and how they would fall. Dixon also goes on to say that when a person is firing a gun, there tends to be a recoil which causes the hand to lift. If the person is firing successively, the barrel can move. He looked at the horizontal line from A to D and interpreted that the shots were fired in that order and the recoil accounts for the spread of the bullets. Nel then says to Dixon, if I put it to you that the only bullet hole that can be linked to mark E with a laser is hole B, what would you say? 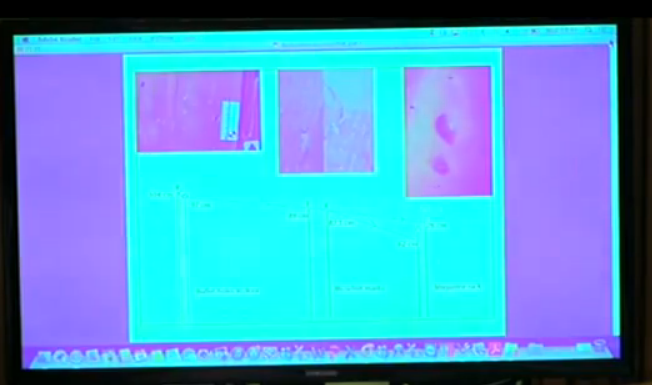 Dixon says that he has looked at photographs taken by the police of their probes in the door versus the probes that Wolmarans put in the door and there are variations. Dixon says the more you put probes in to a door, the wood expands so it’s not exact. Nel tells him that he is talking about a laser, not a probe. But not only that, Oscar agrees that he took that position from the corner when he fired that shot. Nel asks, taking that in to consideration and knowing that bullet hole B is the only one that can be matched up with mark E, what does he think about that? Dixon says that it is possible to put the laser through the holes and move them slightly up and down, and you could hit a number of different spots. He rambles on for several minutes about the different factors that go in to reconstructing the scene, then reminds the court that he’s not a ballistics expert. Nel then asks Dixon if he has seen Wolmarans link bullet hole C with mark E. Dixon is not sure about that, he cannot recall. Nel says, we are talking about the one particular day that you were at the house with this exact door. Can you remember which hole Wolmarans linked with mark E? Dixon asks to look at his notes. 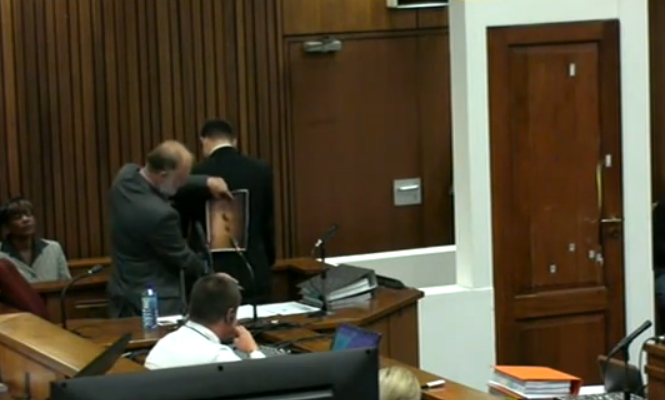 Nel hands them over, Dixon reviews them and then says he doesn’t have a record of that information. Nel asks, did Mr. Wolmarans use a laser? Dixon says yes. Nel asks, on that day? Dixon says yes. Nel then refers him to a photo and asks him if the photo is cropped. Dixon answers that the board was large and the area of interest was cropped. Nel asks, where is the photograph of the whole board? Dixon says it’s on his computer at home. Nel says, so you can bring it to us tomorrow? Dixon says yes. Nel wants to know if splinters can be seen on other parts of that board. Dixon does not give a direct answer, he appears agitated and starts talking about the board and how it’s a ballistic test and his understanding was that Mr. Wolmarans would be giving testimony about this board. Nel stops him and tells him to just bring the complete photograph tomorrow. Nel then has Dixon look at two more photographs. These are photos of a mark on the door. They are not shown on the screen but I believe they are referring to these photos. These were taken on March 13th, 2014, in the courtroom. Nel asks him if he has other photographs of that particular mark from his previous examinations. 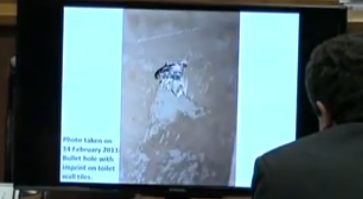 Dixon says there are a number of photographs of the door that were taken at the scene. Nel clarifies, photos of the mark (not the door)? Dixon says yes, photos of the mark. But goes on to say that the lighting here in court showed the mark very nicely. In previous examinations the mark was not as visible. He saw it, he could see the fibers, but they didn’t have good pictures. But the lighting in this courtroom is good so he took pictures there. Nel says he hears what he’s saying but wants to know if he, Mr. Dixon, has other close up photos of this particular mark with the fibers. Dixon says no, he didn’t take any photographs. Nel, very animated, says so the first time you took photographs of that mark is here in court? 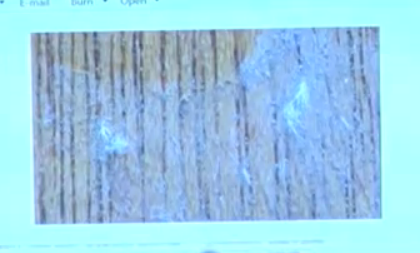 Dixon says that he has taken other photographs but he doesn’t have any where the fibers are clearly visible. So the Defense has no evidence of fibers on the door prior to March 13, 2014. Nel then asks Dixon if he remembers that when he came in to court on March 13, there were people cleaning the door and Dixon was upset by this. Dixon remembers. Nel goes on to say that it was no longer an exhibit, it was in the public domain. And this is the first time you took close up photos of that mark, why? Dixon says in his years of experience with the forensics laboratory, he has often been required to attend crime scenes a long time after the event has occurred. You have to extract original information from the existing scene. Dixon had seen the mark and had seen photographs taken on the day of the event by the police. However when he saw it in court with the lighting, he thought “yes, that is nice.” He didn’t have the opportunity with good lighting and a good camera to take it before that. Nel asks him if he excluded that those fibers could be from the cleaning cloth that was used by the cleaning ladies that day. Dixon says he did not observe the cleaners putting an excessive amount of energy in to cleaning the door. He stands by his conclusion that the fibers are from the sock. He did not take a fiber sample from the door. He only examined the fiber that was picked off of Oscar’s prosthesis and compared it visually to the fiber on the door. He did not do any physical testing to rule out that it was from a cleaning cloth. Truly, I cannot make this stuff up. The Defense, in my opinion, has clearly done some very shady stuff with the sound testing, the mark analysis, the lame lighting analysis, Oscar’s scream test which may or may not exist, their shoddy stand-in pathologist, etc. Part of me almost felt sorry for this guy Dixon because he was clearly used by the Defense. But then I am jolted back to reality and remember that this is a paid witness and he voluntarily put his neck out on the line to say what the Defense wanted him to say. They didn’t force him to sell his soul. Nel notes that Dixon wrote the following: “secondary wood projectiles caused lacerations to the right forearm and punctuate abrasions around the entrance wound to the hip.” Dixon says yes, he saw them on a photograph that he reviewed which was taken at the post-mortem after the deceased was washed. Nel says that Dr. Saayman’s evidence was to the contrary that he did not observe any. Dixon says he’s aware of that. Nel wants to know if Saayman was wrong. Dixon says he saw a photograph of the wound after it had been cleaned and around the wound were tiny little spots where it looked like there had been bleeding. Nel points out to Dixon that he was not at the post-mortem and he’s not a wound ballistics expert. Dixon agrees. Nel goes on to point out that even though Dixon is not a qualified expert, he is still willing to say that Saayman made a mistake. Dixon says he is not saying that Saayman made a mistake, he is just stating what he observed. Nel wants to know if Dixon is willing to concede that Saayman would know better than him.. Dixon says that if Saayman were to state categorically that those spots were not made from splinters then that is his statement. But from what Dixon observed on the photograph, as well as from other photographs of wounds and the sequence of events, his deduction was that it was most probably caused by the small lightweight wooden splinters. Nel says it’s on record that Saayman’s findings do not show any marks of that nature that Dixon is testifying to. Roux objects and says they are looking for a photo of what they are discussing. He wants Nel to reserve his question until they can show him the photo. Nel says, as the court pleases. 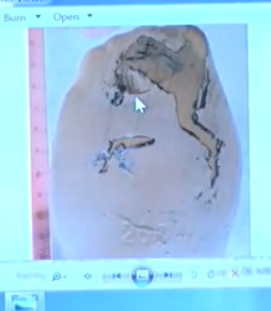 He moves on to a photo of the bottom of Oscar’s prosthesis. Nel asks him who took the photograph. Dixon says that the photo was taken by Mr. van der Westhuisen. Nel wants to know if he was present. Dixon says no. Nel wants to know who extracted the fiber from the foot. Dixon says Mr. van der Westhuisen and he was not present for that either. Dixon says he was not involved with the case at that time. Nel asks him, when did he get involved in the case? Dixon says on the Friday of the bail hearing verdict. Nel asks how he got involved. He says he received a phone call asking him if he would be willing to assist the Defense team in the reconstruction of the scene. They then look at the graph that he testified about this morning. 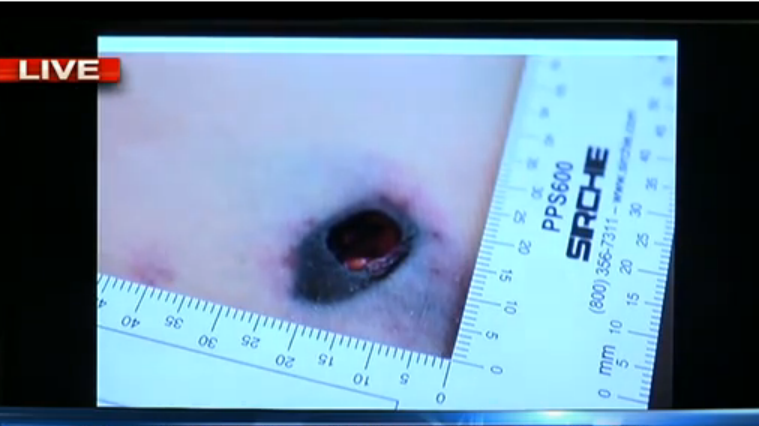 Nel points out that in that graph, Dixon used bullet hole C as the hole that can be linked to mark E. He didn’t use any other holes. Dixon says that was the most probable hole. Nel then has him look at a photo of the blue mark on the buttock and tells him that Saayman would not agree with his opinions about the cause of bruising. That mark was not caused by the magazine rack, but by a bullet. Dixon is rambling trying to explain his conclusions. He said these are his conclusions based on the evidence that he had available. Nel has the court hand the cricket bat to Dixon. Dixon states that he believes when the bat hit at the lowest mark (the 3rd strike) that is when the bat went through the door panel and created the marks that can be seen on the bat. He believes the small plank that broke fell inwards to the toilet room. When he conducted his testing, the same thing happened to him. He also says it is possible that you could get marks on the bat from the bat being wedged in between the panel and twisting it back and forth. He does not exclude this as a possibility. Upon return, Nel wants to review what Dixon had previously said about the kinetic energy of the bullet moving Reeva backwards as the bullet hit her in the hip. Dixon says when the bullets hit the hip and upper arm it transfers energy to the body and could cause it to go backwards. Nel says, we see that in movies when a person gets shot and they are flung backwards. Is it something like that? Dixon says he doesn’t think so. Nel says, because it’s impossible. A bullet that weighs that amount cannot move a person backwards. Dixon tries to back-peddle and says that Reeva’s hip wound caused the instability moving her backwards, he was not stating that the blow flung her backwards. Nel welcomes him to look for any literature that indicates that the force of a bullet can make somebody move backwards. Dixon says he will attempt to look for something to please the court. Dixon testifies that he has been to three post-mortems in his life. Nel wants him to look at a photo that he (Dixon) provided in his report that points out a bruise that was not identified at the autopsy. Nel points out that there is artificial shadowing on this photo. Dixon says the area that he interpreted to be a bruise has a lighter edge around it before the dark shadowing at the edges of the photo. So he believes it could have been a bruise. 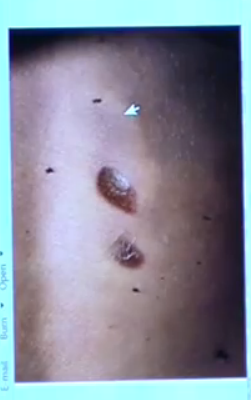 Nel points out that Dr. Botha did not identify this as a bruise, nor did Perumal or Saayman. Yesterday when Dixon testified about this bruise he stated that it was only seen on this one photograph which was taken at the scene on the morning of February 14th. By the next day at autopsy, the bruise was gone. Dixon says he can only say what he saw in the photographs. He does not know if Botha, Perumal or Saayman had access to this photo from February 14th. Nel asks him if he will agree that the bruise was not seen at the post-mortem. 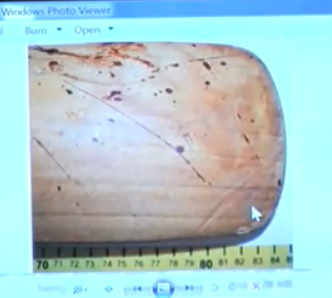 And Dixon agrees, he could not identify that mark from the post-mortem photos. 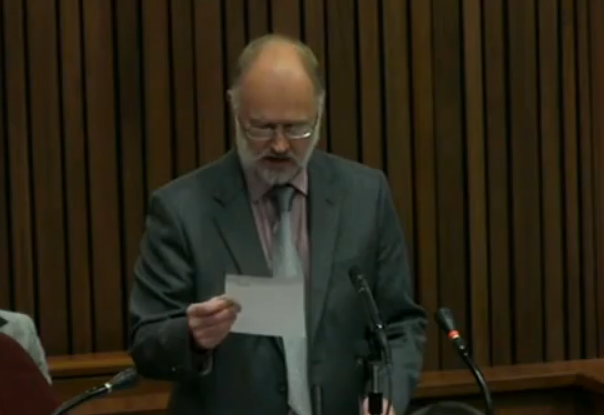 Nel then asks for Dixon’s notes again which he has now slipped in to his pocket. He was probably hoping that Nel forgot about them. He grabs them out of his pocket and hands them over. They now look at the autopsy report and read Saayman’s finding about the bruise on the buttock. It states that there was no foreign object found beneath the skin in that area. Nel asks Dixon from this, did he conclude that it could be a bruise from when she fell against the magazine rack? Dixon says taking this finding from Saayman, plus the photograph plus his reconstruction of the events and the magazine rack, he did make that interpretation. Nel then has him look at page 8 of the autopsy report. Dixon seems surprised by this page, as if he hasn’t read it before. Nel has him read it out loud. It’s where Saayman describes how the shattered hip, pelvis and shrapnel caused the bruising on the buttock. Nel tells him that he just made an inference without reading the full document and wants to know why he would do that. Dixon gives an answer that again, I don’t know how to summarize. It made no sense. But he did very kindly point out to the court that he was a “layman” in this area. Nel tells him that it’s very irresponsible of him to be making inferences in areas where he’s not an expert. Dixon’s response is that he was only testifying to what he saw. Nel tells him, “you interpreted it to fit your case.” Dixon says he does not have a case, he has a scenario which he was recreating. Nel asks Dixon why he would come to this court and give evidence without reading the full report. Dixon says he read the document a while ago. Dixon can’t really give a good reason and Nel has made him look like a complete fool at this point. Nel asks him which days he visited the crime scene. Dixon says the first day he was there was the day of the bail hearing verdict. He didn’t do much, they were just assessing what they needed him to do and at the time they thought that primer residue may be of importance. Dixon says this changed with time to other things. Nel asks him what other things and he answers he was asked to look at the marks and what caused them, and “so on and so forth.” Nel points out that it is of concern to him that he would use a phrase like “so on and so forth” in court. Dixon says there was no definitive statement of what exactly he needed to do, it evolved over time as new things were discovered. Nel asks him if there was anything that he was asked to investigate on his own, without assistance from anybody else on the team. He answers, the suspected varnish on the prosthesis from the door to prove contact. Nel asks him if he ever analyzed the varnish on the prosthesis and could it be linked to the door. Dixon answers yes, he analyzed it and the material that he found on it had the identical chemical characteristics to the varnish removed from the door. 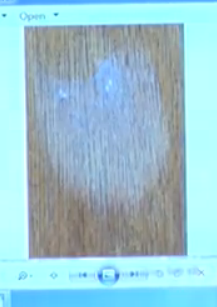 Nel asks him when he removed the varnish from the door to analyze it. Dixon says a piece of wood from the door was given to Mr. Wolmarans last year in a sealed evidence bag and he received that bag from Mr. Wolmarans. Dixon found that the two varnishes had the same composition. Nel wants to know if there was anything else he was requested to do on his own. Dixon says he was also asked to work out a sequence of events. Nel wants to know where the cricket bat is that was used at the range for their sound test. Dixon says the bat is in Mr. Wolmarans’ possession. Nel also wants to know what happened to the first firearm that they used for the test (the one that jammed). Dixon answers that he does not know. Nel asks him if he knows what ammunition was used for the testing. Dixon says it was a problem getting the black talon ammunition, the black colored one, so if his memory is correct it was ranger ammunition that they used, which he says is the same design. Dixon then says he was not tasked with sourcing ammunition and fumbles a bit here… he goes on to say they did tests on the shooting range the night before the sound recording and the ranger bullets were used the night before. The black talon was used for the actual test and the recording. Dixon continues on saying it was dark that night, he doesn’t remember everything but there are likely photographs taken from that night, although he doesn’t have them, but he recollects discussing the ammunition issue with Mr. Wolmarans. Nel asks, who took photographs on that night? Dixon answers Mr. van der Westhuisen. Nel asks him what he took photos of. Dixon is not sure, he wasn’t following him around. Nel asks him if he was photographed. He says he presumes he was but he was not paying attention to that, he was concentrating on the tests on the door. Nel wants to know if he has seen photographs of this test. Dixon says no. Nel asks are these photos seen anywhere, in any reports? Dixon says no. Nel asks if there was a video camera. Dixon says no, it was very dark. Nel then asks, you said you had gunshot sounds on your computer from that very first night, correct? Dixon says he received some files from Mr. Wolmarans later. Nel says, so you still have the results of the first night of shooting on your computer at home? Dixon says yes. Nel asks if he’ll bring them to court tomorrow. He says yes. They adjourn a half hour early today so Nel has time to read through the reports he just received today. Just a note to say that I really appreciate your accurate summaries and observations. I am following the trial closely and am trying to keep an open mind, but the more I see and hear, the more I believe that Oscar is guilty of intentionally murdering Reeva and I believe that this will be the finding of the court. Your wish has been granted! I was really surprised by Nel’s very short cross examination of both and am looking forward to your take on this. The only thing I picked up was them testifying that the kitchen light was on when they arrived and what apparently was Oscar’s phone (how may does he have?!) charging in the kitchen. Also the sudden appearance of a new character called Frank who worked for Oscar and lives at his house. Strange that he has not been called as a witness. He was up and about when the Standers arrived so he must have heard something? The Frank thing drives me nuts. The only thing I can think is that he is refusing to talk and therefore can’t help either side. It would be futile to put him on the stand. But it seemed very clear to me, from both Nel and Roux, that Oscar and Reeva were the only two people in the house that night. Just no mention of him whatsoever by ANYBODY until two days ago. Bizarre. I was very surprised to suddenly learn of Frank’s existence! Apparently he “heard nothing” but he was up and about when the Standers arrived (what, to do a bit of 3.30am gardening outside the front door?!) Seriously fishy …..
My opinion… I think it speaks volumes against Oscar that Frank isn’t speaking. It would be virtually impossible for him to be in that house with all of that going on and not hear or see one single thing. His bedroom is supposedly off of the kitchen. There was a dead body laying on the floor out there! When and how did he wake up and what did he see at that time? He didn’t magically teleport to the front yard from his room. So for him to say he saw NOTHING is obviously not true. Therefore, the only thing I can surmise from that is that there are things that he does not want to discuss. Otherwise, he could easily get up on that stand and help Oscar out.